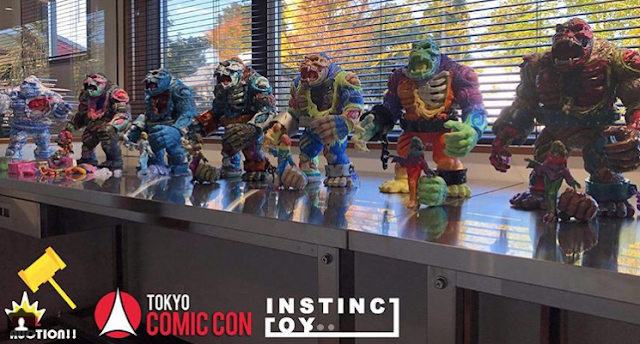 UPDATED: Snaps of the KING KORPSE displayed at the INSTINCTOY Booth (Thanks to images from @takeakikadota! INSTINCTOY has revealed a line-up of irresistible custom-painted KING KORPSE figures, to be made available at the coming weekend’s Tokyo Comic Con 2017 (Dec 1-3). In tandem with the release of James Groman’s “Snarling ver. with Skeleton Lady” Edition of KING KORPSE, 10 artists from around the world had been invited to customise this 32cm tall vinyl behemoth, the result of which will be on display at the INSTINCTOY booth, and made available for AUCTION at the event! If you enjoyed the “Paint Coating Artisans" Special customs from Thailand Toy Expo, this’ll be surely a treat again, and eye-candy galore for folks-n-fans! All customs will be on display at the INSTINCTOY booth from the first to last day (Dec 1-3), where folks can place their bids (in increasing amounts) over those 3 days. All bidding will close on 3rd Dec at 1500hrs, after which the auction will start as soon as all the participants are gathered. The auction for each unique work ends when no one raises the bid. The participant who made the latest bid will be the winner. Custom-painted ”KING KORPSE" for #INSTINCTOY to be auctioned off at the coming weekend’s #TokyoComicCon! Head on over to http://bit.ly/2jrOGMI for auction details & more images! Customs by (above-left) @remjie_malham, (above-right) #Marvix, (below-left) P@inter Net by TOSHIHIKO ITO, and (below-right) @blackseedkenneth. #Remjie #ToshihikoIto #kennethtang #blackseed #blackseedkenneth #tokyocomiccon17 #tokyocomiccon2017 #tcc2017 #KingKorpse (WHAT: http://bit.ly/2ACAeMY) was design by #JamesGroman @jgroman60 and produced by @instinctoy_hiroto_ohkubo. This is the second edition release: “Snarling ver. with Skeleton Lady” - It is so epic, it hurts ohsogood just thinking about it! - The price for each customized figures will start from 100,000yen. - The minimum increment for raising the bid is 1,000yen each time. - Once you have placed your bid, you cannot cancel it . - As per our age restriction, only customers who are over 18 years old can join the Auction. - Customers who want to join our auction must able to make their transaction before 3rd Dec 1700h. - Only CASH payment is accepted at the Instinctoy booth. Credit cards will not be accepted. For further details and intructions, you’d do well to head direct to instinctoy.blog73.fc2.com, where auction bidders are to also take note of the “deposit of 5,000yen when signing the bidding contract”.